Adulteration of food products is a significant threat to consumer confidence and to public health, especially in developing countries. For example, cheaper vegetable fats are sometimes illicitly substituted for milk fat in dairy products. Adulterating butter with margarine is especially common because the lipids in the two products are compositionally similar and yet have a large difference in price. Margarine adulteration in butter has traditionally been detected using chromatography, but this technique is expensive and requires specially trained staff and consumables. Instead, a spectroscopic technique would provide chromatography’s specificity but would be faster with little or no sample preparation, and offers the potential to be robust to supplier and natural variations in butterfat as well. A spectroscopic method could potentially distinguish vegetable fats from milk fat in a butter sample non-destructively and quickly, without touching the sample, using a standardised protocol requiring little special training. This note demonstrates a fast, accurate method of measuring margarine content in butter using Raman spectroscopy. The Raman technique is coupled with principal components analysis (PCA), which shows promise for a robust and easy-to-use operation. Such a method would be a technology platform for ensuring integrity of dairy products. Samples of commercially available pure butter, pure margarine, and graded mixtures of the butter and margarine were prepared and analysed. 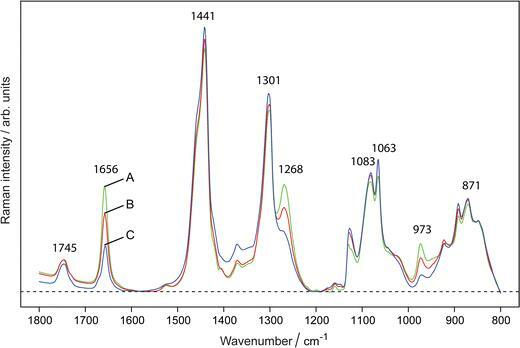 Raman analysis was conducted using a Kaiser RamanRxn1 microprobe with 785-nm laser excitation. The light was both focused and collected through a 50x objective lens. Thirty spectra were acquired on each sample to account for heterogeneity, with an acquisition time of 20s for each.The data were analysed using the R statistical software package. The spectra were baseline-corrected and normalised, and the spectral range was restricted to 800 to 1800 cm-1, which contained information easily rich enough for distinguishing between margarine and butter in the samples. PCA was used to construct a quantitative model for the butter and margarine in the samples. Margarine could be easily distinguished from butter using features in its Raman spectrum. Bands at 1268 and 1656 cm-1 associated with the C=C double bond and at 973 cm-1 associated with the choline group in the phospholipid. Spectra of margarine, butter, and a 50:50 mixture of the two can be seen in Fig. 1. The margarine content of the samples could be determined robustly by the intensities of the 973, 1268, and 1656 cm-1 relative to the other peaks in the spectrum. Percentages of margarine in the samples measured this way closely matched the known values measured by weight seen in Fig. 2. PCA data showed a relationship between the second principal component and the margarine content. (See Reference 1 for relevant figures.) The loading plot confirms that the known chemical moieties of margarine (the C=C double bond and the choline group) vary together with margarine concentration, due to the consistently negative peaks at 973, 1268, and 1656 cm-1, the intensity of which closely follow the margarine content in the calibration samples. PLS regression further confirmed the very good overall performance of the model, with the coefficient plot showing large positive values at the locations of the peaks discussed above. For the calibration data R2=0.991 and RMSECV=3.199. For the test data R2=0.994 and RMSEP=2.757. Spectra shown in Fig. 1 and PCA of model mixtures demonstrate the three Raman peaks at 973, 1268 and 1656 cm-1 can be attributed entirely to the vegetable fat in margarine and that those peaks can be used to quantify margarine content in butter. This important feature means that the fat does not have to be isolated from the rest of the sample, as was necessary in the traditional chromatographic method. The removal of the fat-extraction step is a major improvement toward streamlining the analysis. The Raman method reported here for screening of margarine adulteration in butter represents a significant advance over the traditional chromatographic method. The model developed in this work was robust to the actual concentration of margarine in the samples. Thus, a Raman method does not represent a loss in effectiveness relative to chromatography. Furthermore, the Raman method was simple to deploy and removed the need for a cumbersome fat-extraction step required by chromatography. Raman spectroscopy shows great potential as a robust turnkey method for routine QA/QC of butter and other dairy products.